There were so many great comments this week and I do apologise if I missed some of them. They come in thick and fast these days and I have trouble keeping up at times. I know though that if I don’t get a chance to respond one of my wonderful 365ers will step in and encourage or give advice. Thank you all for making 365 Less Things such a great community. Loved these two comments (here and here) from Deb J. She has taken her mom along on the ride to declutter and has not only changed herself along the way but has transformed her mother altogether when it comes to letting go. Wendy B is not only decluttering her own home but has transformed the local Seniors Centre as well recently. She proves in this comment that communication is key to a good declutter. You can read the condensed version of Wendy’s Senior Centre declutter in the comment strand starting here. Jude tells us in this comment how she applies the simple approach to all the bigger tasks she tackles. Loved this comment from Wendy B on Fewer v Less. She makes me laugh on a regular basis. In this comment Maggie asks for help about what to do with her much loved popcorn tins. If anyone has any suggestions please help Maggie out. Here is a link to a TEDx Tacoma video that enforces the idea of one small step makes a big difference. My husband and I actually attended TEDx Tacoma while on our vacation in April. I had to share this post from Spendwisemom as she is really speaking my language here. A bargain is only a bargain if it is useful to you or exactly what you want or need. Settling for second best just because it is cheap is often a recipe for discontent. I still love a bargain but only on things I really need. Declutter rarely if ever used craft items. When I wrote today’s mini mission I really had papercrafting items in mind but then I had some mending to do and while choosing thread for the task I suddenly came to the realisation that I had far too much thread. Considering the amount of sewing I do these days I really don’t have to keep multitudes of the same colour tread or colours I have no fabrics to match. I will give a friend first choice at these and then the rest can go to the thrift store. Getting some items crossed off my to do list. Things backed up while I wasn’t around and it is nice to feel like I am getting on top of it. « Where is that finish line? Hi Chrissie and welcome to 365 Less Things. You are so right, schools love all sorts of craft items. I have donated quite a lot of papercrafting items to the school up the street from my house. I think it is time I did a little more of that as my craft supplies are still much more than I need. Thank you for the encouragement. Hi Colleen – Your modest little group of threads makes me smile .I may have mentioned this but I recently sorted my cotton reels and gave over half to my friend who sews every day – I had over 150 -there were so many I couldnt see what I had anyway. The reason I had so many was because of a garage sale windfall once and also because I “inherited ” my cousins threads when she downsized . And then I still had to go out and buy some when I didnt have the exact shade I needed anyway.! You’ve often referred to decluttering your craft items and I’ve always thought that doesn’t apply to me but it SO does! Since sorting the threads I’ve also gone through lots of other things like bias binding (4 lifetimes worth) and elastic and zips and buttons .Even though they were all neatly stored and labelled I have now reduced the overall number of containers by a third .And the funny thing is – I will probably have another look in a year or so and reduce even further . I assume you do a lot of sewing with all that haberdashery. My mum was a private dressmaker and our home growing up always including sewing and supplies. I don’t remember sewing on a machine for the first time because I was too young to remember it. I used to sew more when my kids were little but not so much these days. I mostly only repair things, hence why I don’t need so much thread. I decluttered many of my sewing supplies way back earlier in my 365lessthings days. I had elastic that had long ago perished from lack of use, lace and other items that just weren’t being used. My existing crafting supplies are mostly papercraft and jewellery making. I dare say you will revisit your stash of supplies soon enough and realise you have more than you need. I wouldn’t leave doing that for a whole year though. I used to sew a lot but I’m working more and sewing less .I’m sure I will declutter my supplies even further but what’s left doesn’t actually take up much room – but you are right – I still have more than I need- and I’m not using it. OK – will have another look! I am a quilter and have gradually been reducing my threads so that I only have black and biscuit colour which I find is perfectly fine. I have about 5 or 6 other colours which I use for English paper piecing, and places where the colours won’t be seen. I love the simplicity of having what I need, but only what I need! I agree, the simplicity of only having what one needs is very liberating. Just thinking about that statement makes me want to go and find something else to relinquish to the thrift shop. All the posts by the people other than me were very good. In fact, I feel like our group is made up of a bunch of highly intelligent people who are constantly giving each other insight into living life. I’m certainly enjoying myself keeping up with this blog. An interesting gift giving site. What I found especially interesting is that it mentions homemade items. The site Katherine shared was interesting. I found more than just the one highlighted post to be insightful. I liked the TED speach and the post by Spendwisemom to also be good. A good week. I agree Deb J, sharing our experiences is helpful to each other. I find that I don’t really need to address decluttering specific types of object but talking about the reasoning on how to let go is far more helpful. With all the different views the readers soon find one that works for them. Hey Deb J, I feel similar. funny and smart people around here. happy birthday to your mum!! Hi ladies – I enjoyed browsing in the meaningful gifts site. I had come to the conclusion having three teenagers in the house, that gifts are best restricted to vouchers especially itunes, movie theatre, favourite clothing store etc. Of course, cash is always a winner too, my son bought his first car and he’s happy to receive his annual car registration gift wrapped (although he says, the bow was unneccessary). But aside from that, yes an experience is a wonderful gift. Though I wouldn’t be too sure about if my hubby bought me a swimming with the sharks gift voucher………….. Personally I prefer a gift voucher to my favourite digital book store. Around August/September last year iTunes cards went on ‘special’ a $50 card for $30 and there isn’t a time limit put on them, so this was a great way for me to stock up on gifts at a better price than December. my daughter would love the swimming with the sharks most of all. I liked the experience gift suggestions best because there is no residue except great memories. My psyche was damaged by sneaking out to watch Jaws as a kid. Ooooh, I want some of that thread 🙂 I actually had to go and buy new thread from Spotlight the other day, which annoyed me immensely. Mum gave me all her old sewing stuff years ago and I’d finally run out, plus none of the op shops locally had any (most unusual). Oh well, I only bought what I needed for a current project so I guess it’s not clutter. Lucky you, getting to go to a TED conference. Hi Loretta – are you NZ or Australian? Its just I know we have Spotlight in those countries, but have never thought if they are elsewhere in the world. Loretta is Australian Moni. We actually got to meet when I was in Melbourne last. the TEDx day was great. Not all of the speakers were greatly interesting but each had at lest something to say that hit home with me. Reading through the Faves I did enjoy the Gifts one and all the others, but the gifts link and Moni’s comment about gifts for her kids reminded me of the conversation/arguement (convo for me arguement for my sis) I had with my sister over getting a gift for my son for doing well at the last Dance Comps we had here in Perth. I’m not beyond buying something for anyone, I do believe in research before I buy and I certainly am not the type to just buy a ‘Thing’ because I feel pressured too or it seems to be the norm. My sister wanted to get my son something and got so hot under the collar when I suggested getting him a voucher or a few bucks to add to his bank account, IF she really felt she had too! I can’t control how others will take my suggestion of a worthy gift. The arguement that ensued would make political leaders look they they were ‘kinda trying’ I know I should of just let her rant longer and fizzle out BUT! I didn’t, I wasn’t going to be backed into the corner and have my values blasted, and then end up with more stuff!! (Mind you I knew what my son would have said to her if she asked him what he would like as a gift for doing a great job!) I suggested to my sis to take my son to the movies or spend the day with him or just a cuppa and a chat or even just a “Well done mate I’m/we’re so proud of you” No that would be met with a “But I can do that anyway” What I tried to get through to her is 1) we’re moving very shortly (more to pack) 2) He really doesn’t need anything decorative, he has what he refers to as ‘enough’ 3) Buying a gift for the sake of giving something is counter-productive so why not give $$$ or a gift card to somewhere that he can get what he wants/needs v’s getting another dust collector!!! I have no problem with my boy having stuff I do have a problem with him having too much stuff that just sits and isn’t useful or even wanted/needed. Well she ‘spat the dummy’ and just couldn’t see that if she really felt she had to mark the occasion with a ‘gift’ then let it be useful or needed. “WHAT THE” Dear ladies am I too harsh? Did I just want less coming in for my own reasons or am I setting an example that will hopefully rub off on my son and he won’t be getting himself into a clutter situation or worse still, financial situations that could be avoided by seeing ‘things’ for what they are, realising that want vs need are two very distinct categories. I don’t feel we restrict him in any way except for putting a lid on ‘kneejerk purchases’, he’s into gaming but he buys with his own money and trades when the time is right to let a game go and he has no qualms about ‘Letting Go’ of gifts once they have served their time, use, purpose, whatever! Have I deprived him of a ‘thing’ that might have been really nice or have I made a decision on my son’s behalf to ‘stop the flow’?? Want to know what my son said when I told him about what happened and that I may of deprived him of a few $$$ or things.!!!!! He said “It’s just stuff and I really don’t need more stuff if she would like to give me something some $$ would be good for my bank account, but I don’t have to be rewarded with gifts everytime I do something well! ” He then went on to say he could buy what he wants when he wants it!!!!! I think I may buy my boy a game!!!!! Hahahaha (only kidding)! I bought him him a chocolate bar and an icecream! Hi Dizzy – I agree – teens are such fickle creatures that shopping on their behalf is such a no-go. And I decided this before I started decluttering. It sounds to me that your sister hasn’t understood the lengths your family has gone to recently to have the ‘brain change’. Maybe a gentle phone call to her to REALLY explain the changes you as a family have made of late would be helpful. I’m sure she had it in her head that she was going to do something wonderful for her nephew and it was scuttled…to her disappointment. I think she should be happy to be guided by you when it comes to your boy. I came across a saying a while ago and I stole it as my own. It’s on the inside of my pantry door….”You can have anything you want in this world…you just can’t have everything. What are you willing to give up to have that thing?? ?” I realise this probably doesn’t strictly apply to this instance but it’s been helpful to me lately. It sounds like you have your son on the right track, now for the sister (God bless her). I know from experience that extended family sometimes THINK they understand your family situation but they really only hear a word here and a sentence there and create their own opinions from that, often incorrectly. It’s not their fault. It’s just how it is. I’d say you have a generous sister so talk to her. She’ll see what you are doing, given time…best of luck. this. so much. but then again, if they have this picture they act towards you with it, and therefore their picture always frames you too. thats why family is such a hard business. especially if you “suddenly” decide to change something in your life. I agree Moni, I don’t buy my kids anything anymore unless they give me detailed instruction as to what exactly it is that they want. Otherwise it doesn’t get used. Hence the twenty emails back and forward to Liam while trying to buy him skate shoes in the US. You will be able to relate to this bargain. We got him to pair on Cons and a pair of vans for $160. We would have paid that for one pair of Cons in Australia. Colleen, I am green with envy! And for the non-Aussies, a Bogan is?????? Hey Dizzy – just reading Sue D’s comments – just an idea, did you keep a log of what you decluttered? Cause that could help your sister understand. I have lots of friends who think they are declutterers (is that a word?) but that just means once or twice a year they have a bit of sort out. So maybe your sister doesn’t realise how dedicated you have been to the War Against Clutter and what a mind change you’ve gone thru. I learnt the hard way that teens prefer to make their own purchases. I’d buy things I thought one of them would love to get a very luke warm thanks. So now it has to be approved before any transaction happens. And gifts…..definately cash or vouchers, unless I was specifically asked by one of them for something specific, in which case I want the exact model number and colour preference! And to think of all those years I had to receive Pasta necklaces, promise vouchers and “art”. Hi Moni, I did keep a record of all the ‘crazy crap’ that got jettisoned from our lives and yes I think I will show her that. She is generous to a fault but on one hand they are pinching pennies to help pay off their new home and generally live, but on the other hand considers not getting the kids or anyone else a gift for whatever reason to be mean! I so totally tell her that it’s not necessary but it is ingrained, I just chip away at it every chance I get. Brain Change is gonna happen sooner or later. judging from the reaction of your son when you told him about the incident I would say you are raising a well adjusted kid there. I see no harm in suggesting to friends and family that he doesn’t need anything or has got to the age where he is better to choose for himself. Some people however don’t deal with the idea that gift giving isn’t compulsory. It isn’t as though you were telling she shouldn’t buy anyone gifts ever, that would be a different story. You however were giving advice as to what your son does or doesn’t need and I think you have every right to do that. Like you say she will get over it. great comments this week. and great links. my favourite was Kathrines long article. very smart things. also liked the TED Video, because of the sentence: “I will not wake up Gandhi tomorrow.” Amazing thought. it takes effort to change. I like the TED video because they said that your message is stronger when money isn’t involved. Steve nudged me when that was said. My message must be strong here at 365 Less Things in that case. I also decluttered quite a lot of sewing stuff recently. I inherited much last year and whittled it down quite much. I’m not really systematic in this: sometimes I’m straight off to the thrift store and sometimes, I try selling first. 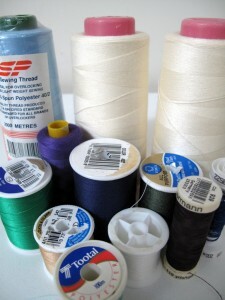 congrats on the sewing supply (I own a needle and 3 little threads, thats enough to mend a button). And on selling (I am very active on amazon and ebay ads these days too)… Making money is a great feeling. sanna, was it you that said she wanted to put the linens into the wardrobe? I kept thinking about this and yesterday I had an epiphany. I remembered that I have still a shelf in my wardrobe that I never built in. it went in above the hanging rail which is now a bit lower. I quickly done that and placed the bedsheets and towels into it. I will live with that now for some time to see if that works out. and if it does, I need one more rearrangement and then my drawer can go. during that I found another shirt to get rid of (how on earth could I possibly own so many shirts?!?) and a washing cloth that I dont use. Yes, that was me. Congrats on making that work so fast. Good for you Sanna. That reminds me I must put my ski gear on ebay. Better go there now and get on with that. The picture will match the mission next week too Ideealistin so enjoy. Though i don’t you will ever see any more book decluttering from me as I think we are now down to the bare minimum. But you know how it goes, never say never right! Okay, here it is. My daughter made a gingerbread house when she was in kindergarten that was so cute that I put it in a ziplock bag and put it in our china closet. I especially loved it because it had a red candy heart for a door knob. (I know, I know)! Anyway, my daughter is 35 now and married with 2 kids of her own. Everytime she came home, she would say, Mom, you really need to throw that away. It was not falling apart or anything but just looked old. I loved it. BUT…the last time she was home, I pitched it out with her approval. To be honest, I still see it (in my mind’s eye) when I look at the cabinet but it is really and truly gone. And I feel really proud of myself for taking that step. I am just too sentimental my kids tell me but I am trying hard to look at things more critically. I got a digital camera for Christmas last year and will take photos of some of the things that have seen better days. A way to remember without clutter. Wow! That’s a long time to have a gingerbread house. Didn’t it get moldy? I think taking photos and getting rid of the clutter is an excellent idea. I even bet you end up never looking at the photos. Breaking up can be hard to do but once the initial wretch is over it can be amazing how completely we get over the whole thing. Just had to share this. This weekend I sorted and tossed some old Christmas cards, threw away about 25 magazines – I looked through them and probably saved 1-2 articles each and tossed the rest. I noticed that every other page is an advertisement and sometimes 3 or 4 pages of ads before another article. Lots of these are rehashes of the months before. Anyway, I was proud of myself – what was I saving them for? Also, tossed 2 weeks worth of newspapers – I save the crossword puzzle for an elderly aunt and if I don’t get time to cut it out that day, I just toss it under the telephone stand until I do. Well, look how long it has taken me to catch up. No more. Everyday, I will cut it out and put the paper in the recycling bin that very evening. I tried to find one thing, at least, in every room this weekend to toss and felt like I did a very good job. Thanks for the inspiration. Love the daily missions. well done, you are really on a roll with the decluttering. Magazines can be a curse and like you say for the most part they are nearly all ads. I got out my one box of must keep craft books and magazines on the weekend and decluttered all the remaining magazines in there. I only keep them for the photos of projects I might like to make one day. The truth is I will probably never get around to using them and if I want inspiration for a craft project there is an endless supply of examples on the internet that cost me nothing and take up no room in my house. Good pledge to keep up with cutting out the crosswords by the way. It really doesn’t take long to do in the big scheme of things does it? When I think how few hours there seem to be in a day I just stop and think about how much sitting around watching television we do of an evening and realise how much time wasted there is in my day. Granted I am usually replying to blog comments or working on a post at the same time but both distract from each other and how many times do I need to see the same episode of The Big Bang Theory anyway. That being said I know we all need relaxation time so I don’t waste time feeling too guilty about it.